On top of our impressive facilities we also boast Kent’s largest and finest Skate, Surf and Climb shop stocking all the most popular brands. 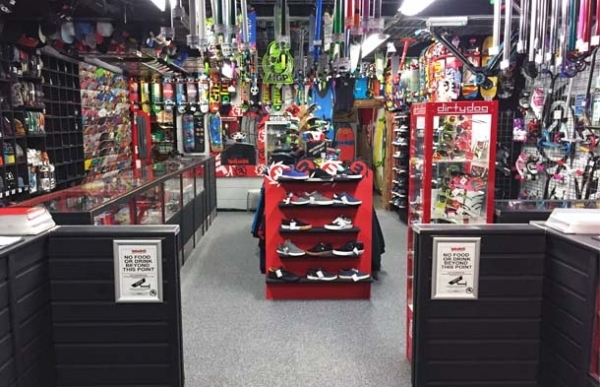 Our skate department stocks the best skateboards, scooters, inline and quad skates plus BMX parts and accessories. We stock a great selection of helmets, pads and safety gear. Our Surf Shack stocks surfboards, bodyboards, skimboards, wetsuits and all associated accessories. The climbing department holds stocks of all the essentials including climbing shoes, chalk bags, harnesses and ropes. In-store we also have clothing, trainers, bags, wallets, hats, sunglasses and much much more. We are ready to assist you in whatever sport you’re interested in and carry out repairs and custom build skate and scooter set ups from scratch. While we do have an on-line shop with some essentials listed it is only a fraction of what we have in-store and we pride ourselves on giving a personal experience to our customers. Feel free to call on 01843 866707 to enquire or discuss any stock with us. Please note you do not have to book online you can just turn up at the start of any session and pay on arrival.